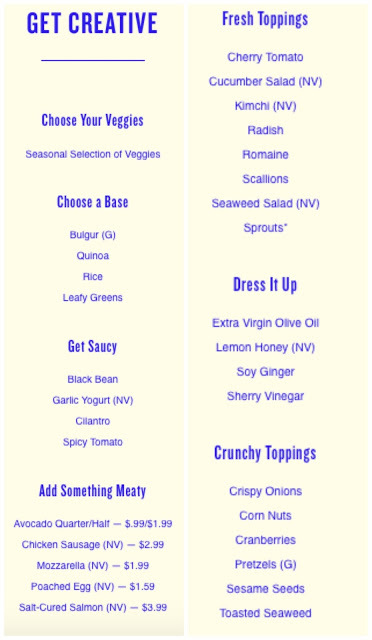 Beefsteak's menu is set up as a do-it-yourself buffet of veggies, veggies, and more veggies. 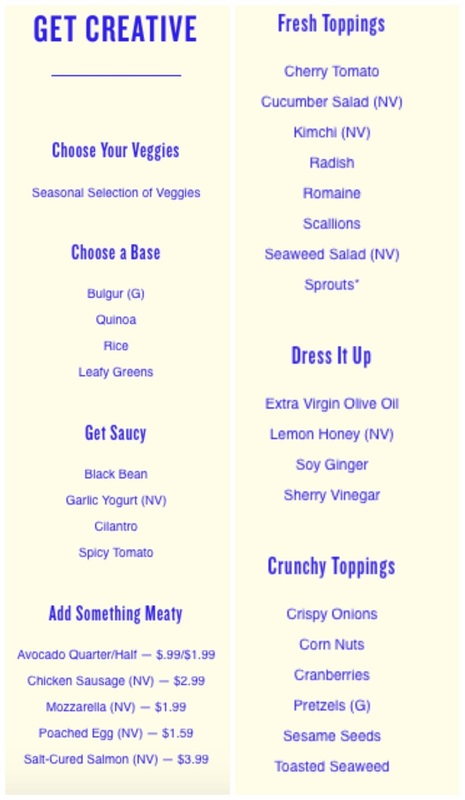 Choose between a cold salad or a warm bowl, where chosen vegetables are lightly boiled to heat them up. Don't worry about cross contamination in the boil bath because only vegetables are plunged in. 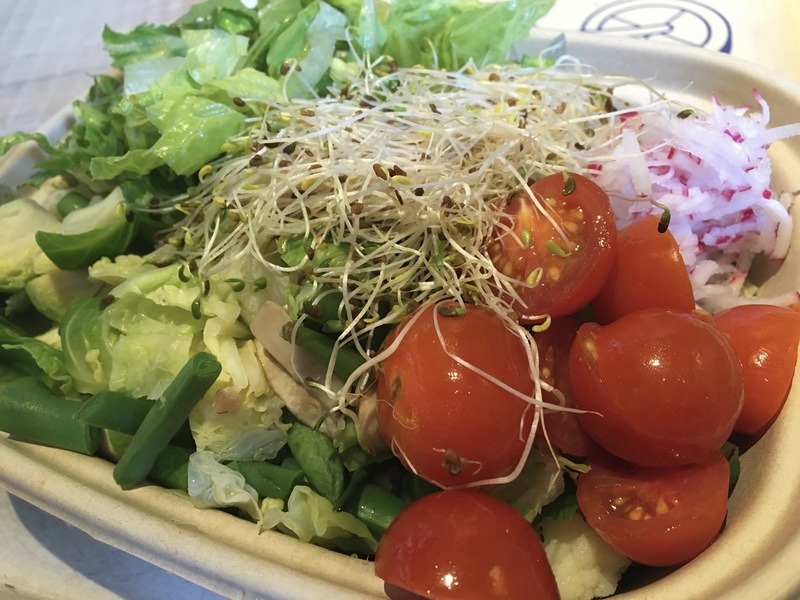 From there, hot bowl patrons choose a base (only bulger is off limits), sauces (skip the yogurt for dairy-free), and meats, fresh toppings, dressings, and finishing flourishes. It is a little overwhelming to choose between so many fresh, flavorful veggies, but the staff definitely are patient, and knowledgeable about what is- and is not- safe for people with dietary restrictions. For my hot bowl, I chose green beans, brussels sprouts, cauliflower, and mushrooms for the initial dousing in boiling water. Adding to that, I chose rice, cilantro sauce, cherry tomatoes, romaine, radishes, and sprouts. All in all, this resulted in one plant-powered bowl. I think I got my full serving of vegetables for the day in one sitting! The vegetables were all fresh- crispy and crunchy for the non-boiled ones, soft but not mushy for the ones boiled. The cilantro sauce was bursting with flavor, and added a nice accentuating flavor that worked with the vegetables but did not overpower them. The rice was cooked perfectly, adding just the right amount of carb-ness to back up all the vegetables on the plate. 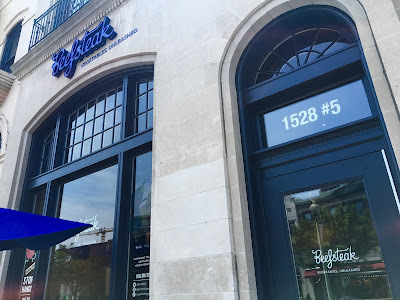 Overall, I loved Beefsteak and wish there was something similar to it in Baltimore. Although I eat pretty healthily, I often struggle in the vegetable quota department now that I am so busy with internships and classes. The food was fresh, affordable, and the staff were super willing to walk me through all the options, which combine for a truly great experience. With minimal amounts of gluten and dairy, this is a restaurant where you can rest assured that cross contamination is a super small risk. The focus here is fresh food, and nothing is better (and better for you) than that. Update 7/29/2017: On a recent visit, I tried one of Beefsteak's pre-selected blends- the "lime after lime." I omitted the corn/edamame combo and added a poached egg for added protein. I love the flavor combination with a lime-y vinaigrette and fresh lettuce, tomato, and scallions. The sunflower seeds add a nice textural contrast and the bed of quinoa underneath soaked up the flavorful dressing. The only component of the bowl I wasn't thrilled about was the egg, because it was almost too liquidy and didn't quite fit into the flavor profile. Beefsteak has also introduced a line of drinkable gazpachos in partnership with Tio. I first tasted Tio gazpachos at Expo East 2015, so it's nice to see it out "in the wild" at Beefsteak. Be sure to shake the beverage before drinking, but it's a nice way to add additional veggie power to your lunch break. Special Features: Download their loyalty app to earn points towards free Beefsteak!